After days of silence over an outage that's outraged developers, Apple has announced that its Developer Centre was subject to an attempted intrusion. “Last Thursday, an intruder attempted to secure personal information of our registered developers from our developer website. Sensitive personal information was encrypted and cannot be accessed, however, we have not been able to rule out the possibility that some developers’ names, mailing addresses, and/or email addresses may have been accessed. In the spirit of transparency, we want to inform you of the issue. 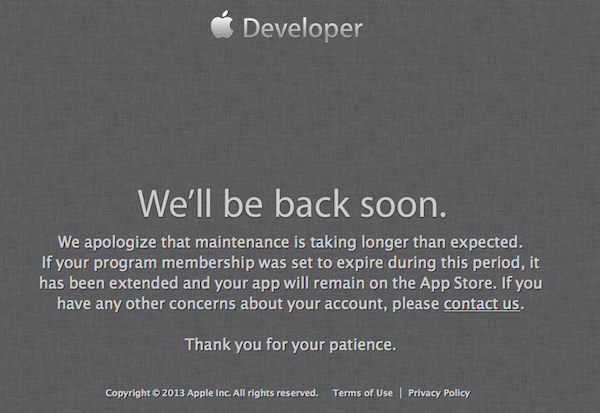 We took the site down immediately on Thursday and have been working around the clock since then. According to Cnet, some users have complained about receiving password reset e-mails, indicating that although passwords were not compromised in the intrusion, the attacker had obtained a number of Apple developer account IDs. A UK-based chap calling himself Ibrahim Balic claims he reported a dozen or so security vulnerabilities in the Developer Centre to Apple shortly before Cupertino yanked the website offline last week. It's believed his discovery was treated by staff as a compromise of the system, but yesterday he denied any wrongdoing and insisted: "This is definitely not a hack attack."